I'm not sure how I ended up choosing a Tyranid Spore Mine to be the first model I sculpted from scratch using nothing other than greenstuff. Maybe because it's fairly organic and that gave me lots of room for error since I've never done this kind of thing before. Maybe it's because I got my hands on a few "tube makers" a couple of months ago and this seemed like the perfect excuse to use them on a real model. The idea to build this guy came from wanting to use the tube tools I'd looked over a few months ago (Green Stuff Industries and Masq-Mini). 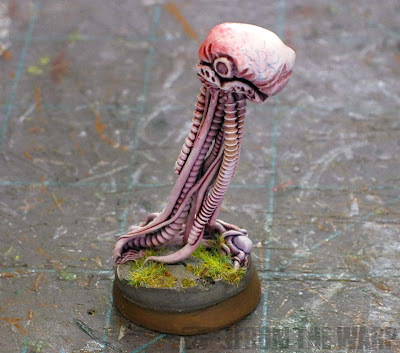 Once I decided I was going to build one of these, it became a no brainer to put it on a suitable Tyranid infestation themed base as well. It looks cool and I need all the help I can get to improve the look of my sculpting. I picked some of these up from Secret Weapon Minis a long time ago and they've been patiently sitting in my bits box waiting for this day. I knew I'd use them someday, I just didn't know when. It's already partially covered in tentacles and bubbles and junk. Perfect. I started by drilling a hole in the middle of the base and adding a brass rod (in this case a heavy duty paperclip) for the structure of the model. The top is bent over horizontally to add some stability to the creature bulb on top. As I've been sculpting things over the past few weeks, I've taken my extra bits of greenstuff and set them on the rod. This has helped me build up the bulb over time using left over greenstuff. Once I had enough built up, I added one more layer over the top to finish off the shape of the bulb. Using my sculpting tool, I cut some organic shapes into it, added a ruffle around the bottom for the tentacles to hang from and tried to make it look the part. I suppose if you were looking to do this for real, you could sculpt your bulb separate from the model and then cast it with a two part mold. That would allow you to make a number of these quickly depending on how many you needed. I don't know how many Tyranid players use these or how powerful they are in the game. This way the most fun. Using my two tube makers and tossing in a few rolled lengths of greenstuff, I kept making tentacles and attaching them to the bottom of the bulb until I had what looked like a good amount. A very scientific approach as you can see. I did try and maintain a balance between the bulk hanging from under the bulb and how big it was. I wanted them to look like they were the right amount for that size creature. Like I have any idea how many that should be. Being the creative person I am, I opened the Tyranid codex and looked for a good paint scheme for this guy. I settled on something that could be taken for hive fleet Leviathan. I primed my model white and used a series of washes to add the color to the model. Mainly Baal Red and Leviathan Purple. I did add a small touch of Gryphonne Sepia under the bulb for some color variety. I thinned out some GW Regal Blue and added a few veins along the sides of the bulb as well. Something to break up the huge blob of white up there. The base was painted light grey, given a wash of thinned GW Charadon Granite and then drybrushed with Dheneb Stone. After looking through the codex, I decided I would try to mimic the early stages of the infestation where the planet life was flourishing prior to being consumed by the arriving wave of bugs. A little bit of grass and some ground turf sprinkled into the cracks of the sidewalk worked perfectly for me. The standard Graveyard Earth trim finishes off the base and gives it that official look. As far as scale, this guy is much bigger than your regular GW spore mine but much smaller than the Forge World version. Maybe the Forge World thing is completely different... I know it looks the same though. This version stands just a bit taller than your regular 25mm base troop. Makes him a bit more imposing I think and he appears a little more dangerous than he really is. All in all, this guy was a blast to build. Being as organic as he is, I didn't have to worry too much about getting things perfect. Not counting the build up time to get the bulb the right size using left over greenstuff, you could build one of these in a day fro start to finish easily. I think the larger size works better too. Wow! Ron looks pretty darn awesome. Am impressed, can't believe it's your first effort. Not extremely experienced with sculpting myself (I merely dabble), but I do really like the contrast between organic and constructed materials. Building up a piece of armour takes much more planning, adjustments and fine-tuning, while organics generally seem to come down to posing and posture. Incredible! Very impressive. I can never seem to persuade Green Stuff to stay malleable long enough for me to make it look even remotely realistic, so I stick to doing shoulder boards and moustaches. How long did it take to put this together? Really top-quality stuff there. Really nice work. Out of interest i order the tube tool from Masq-Mini last week after reading your previous review, and was just wondering how look it took for the tool to be delivered? Hephesto: I actually use a couple different tools depending on what I am trying to sculpt. I'll snap some pics and put up a post. It would be far better than me trying to explain it here. It's nothing fancy though. Colonel_Scipio: Maybe an hour total. I started with the wire in place and some old greenstuff already on it to help bulk out the bulb head. IDICBeer: As fun as that might be, I don't see that happening anytime soon... or ever. Keith: To be honest, I don't remember. I don't pay attention to the mail as close as I should sometimes. I'd guess it took an average amount of time. I have sent them emails that have gone unanswered though which is kind of disappointing. Nice work Ron! You mentioned the size issue, I have to say the stats will remain the same, make it as ominous as you want! Nice work! For me, a set of "colour shapers" is invaluable for sculpting. The soft tips really help with organic or smooth shapes. Very impressive sculpt and of course the painting is top notch. Great looking mine, Ron. I think this is a great first effort and scale-wise, the mines can be forgiving, which is what a person needs in their first works. I think most people start with Muffled for that reason. The tentacles look great, which device did you use? Some of them look inverted and it has me curious. nothing much to add apart from "wow". Organic things are easy and hard at the same time. Easy, because you don't have to keep yourself confined to sharply defined boundaries the way you have to when you work with mechanical things, hard, because of the exact same thing - there's more fluidity, but there has to be a defined shape, or you'll get a formless blob. 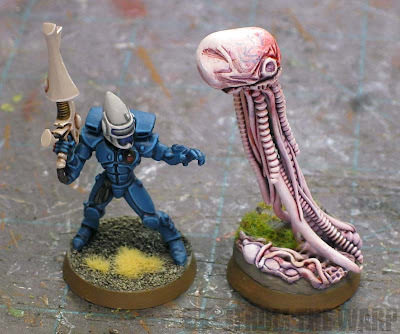 Anyway, you've really made a great Mine, properly icky for a Tyranid organism - and yes, that Guardian is so very, very dead. Frankly that is a great job for a first shot at sculpting from scratch. Any "imperfections" are clearly blown away by the top notch paint job. Seriously, that's pretty frikin' awesome. Fayte: Absolutely... the stats will be the same. I may try and make my next one bigger along the lines of the FW one if I do it again. Mike Howell: I have two that I use when I sculpt. I still use the old GW tool for most of my work though but that might be due to the fact I've used it for so long. Thor and Matt Farr: Thanks guys. I really painted him to help cover the sculpting imperfections and see how he turned out. Da Masta Cheef: I grabbed him because I was using him for another post at the time. I should have grabbed a terminator as well for comparison. Old School Terminator: Forgiving... that's the perfect way of saying it. Lots of room for error without messing up the model. I set myself up for a win going this win. I need all the help I can get. I used two tools for the tubes in addition to rolling smooth ones. Green Stuff Industries and Masq-Mini. Links to reviews of each tool are at the end of the post to see what each one can do. Marcin Ciszewicz: Very true. Fortunately, this is not an organic "monster" we have any real world reference from so I have even more leeway in building him. If he were a "real" creature, I might have more problems even though he is organic. R.C. Fountain: It's definitely getting archived. I'm going to see what else I can do with some Tyranid pieces to spread my wings a little more. Ron, that is REALLY nice work. 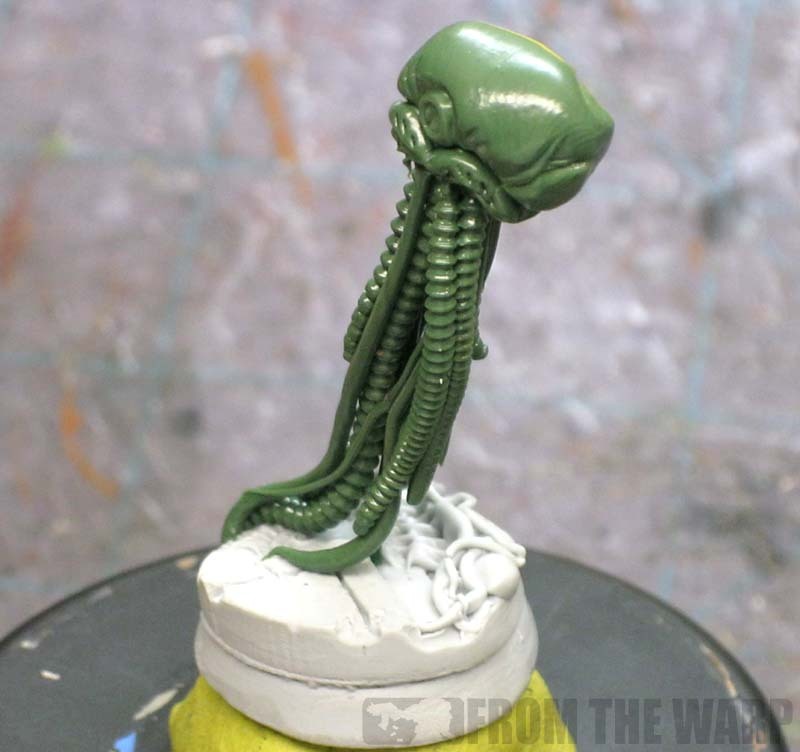 If you would confirm that you used a Tentacle Maker (it looks like you did) some where in that mass of squirm I'd like to post a link or pics of your work on the Green Stuff Industries blog. Green Stuff Industries: Thanks. I certainly did use your tool to make some of the tentacles. The whole thing is swirling mass, but they are in there. I'm waiting for you guys to come out with some more shapes and sizes too! Just posted the "New Products!" announcement like 2 minutes ago. 2 new sizes and a Tool Box deal for all three. I've had them for about a week but am buried in Bay Area Open work... painting my army, terrain making, marketing stuff. Sooooo much to do! Simply stunning, especially given this is your first sculpt from scratch. I'd pay money for that! With regard to the actual scuplting of the greenstuff, how much do you let it cure before you start fashioning it into the shape you want or do you just mix it and go for it? Green Stuff Industries: Oh my, I like those new ones. Especially the smaller one. Sendraks: Thanks. as for as letting it cure before getting to work, I mix and go for it. The only time I wait is when I am doing the flowing banners and I need them to keep their shape as I work with them. Oh my. That's really good! I wanted to make some spores using cherry pits as the base, but never got around to it. This looks exactly how I wanted mine to look. That's a great looking spore! Very nice, feels much more lovecraftian than the GW ones. It looks classy, and the size feels right. Nice, this gives me some ideas. Thanks for sharing! samson: Glad you like him.